Buckle depicts "CSA" and is a rectangle belt plate used in the Confederacy. This style is cast of pewter, and does not bear a border. These are believed to have been made in Rome, Georgia and were primarily supplied to western troops. Durability was a problem, often these buckles would simply break into pieces. 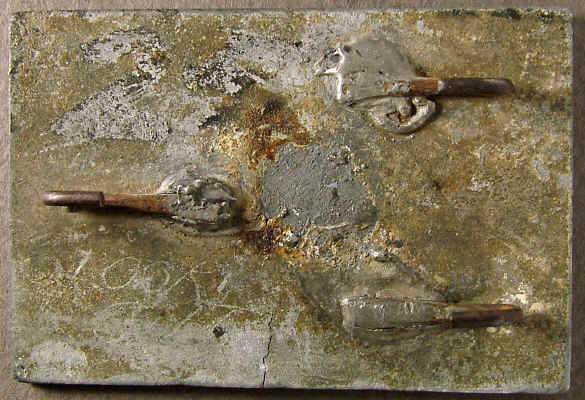 Plate is cast, wire hooks were soldered into place, back is sometimes marked with lines to accurately place the hooks. Ref: Mullinax Expanded Edition, Plate112. 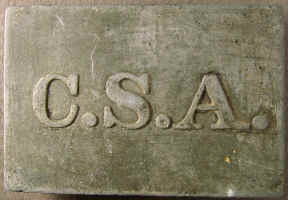 P0322...Confederate rectangle belt plate, CSA, cast pewter, Confederate wartime manufacture. 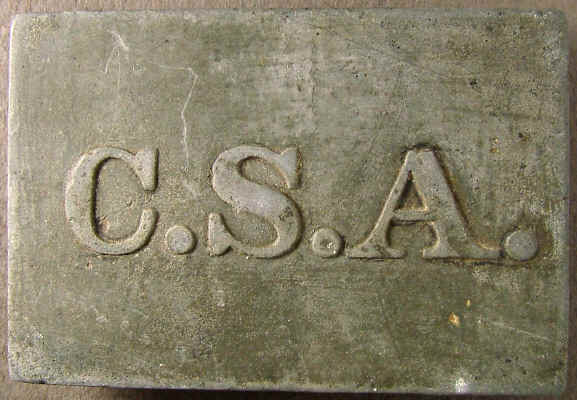 Buckle depicts "CSA" and is a rectangle belt plate used in the Confederacy. This style is cast of pewter, and does not bear a border. These are believed to have been made in Rome, Georgia and were primarily supplied to western troops. Durability was a problem, often these buckles would simply break into pieces. 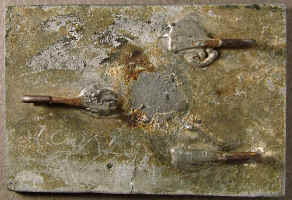 Plate is cast, wire hooks were soldered into place, back is sometimes marked with lines to accurately place the hooks. Plate measures 49.7mm X 74.6mm. Early pickup, all hooks intact. Recovered: Lookout Mountain, Tennessee. Ref: Topper, Civil War Relics from Georgia, pg. 54, actual item published. Ref: Phillips, Excavated Artifacts. pg 46 item 4, actual item published. Ref: Mullinax Expanded Edition, Plate 112.